This textbook covers all aspects of materials science relevant to the practice of dentistry. It is aimed primarily at undergraduate dental students, although it will also be useful for practising dentists, dental technicians and dental assistants. 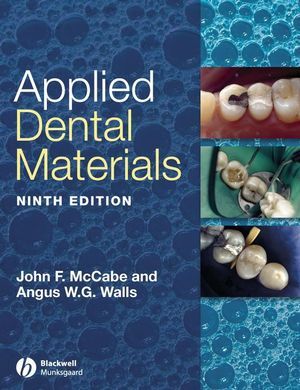 The 9th edition has been extensively revised to include the many advances in dental materials and their use that have occurred during the past nine years. The chapters on Resin-based filling materials and Adhesive restorative materials have been expanded significantly with new coverage of fibre reinforcement of composite structures and polymerisable luting agents. A brand new chapter has been added on endodontic materials. John McCabe is Professor of Dental Materials Science and Angus Walls is Professor of Restorative Dentistry, both at the School of Dental Sciences, Newcastle University, UK. Properties used to characterise materials;. Gypsum products for dental casts;. Gold and alloys of noble metals;. Ceramics and porcelain fused to metal (PFM);. Impression materials: Classification and requirements;. Elastic impression materials: Synthetic elastomers;. Requirements of direct filing materials and historical perspectives;. Adhesive restorative materials: bonding of resin-based materials;. Resin-modified glass-ionomers and related materials;. Temporary crown and bridge resins;. Requirements of dental cements for lining, base and luting applications;. Cements based on phosphoric acid;. Cements based on organometallic chelate compounds;.